Happy Friday, Crafters! Here at Creations Galore, we have so much paper we're not sure you'll ever see it all. That's why we've dedicated one day each week to bringing you one of our favorites, giving you the opportunity to say, "Wow, they have that?" This week we're dreaming of sunny, warm weather. Therefore, we're showing off this fun travel paper by Reminisce. 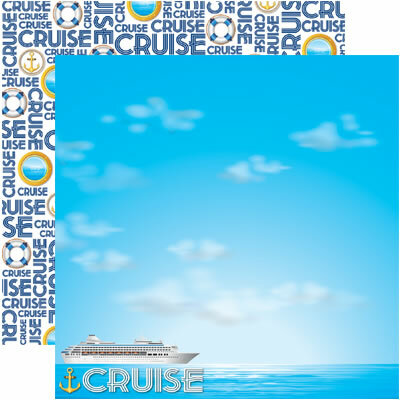 Cruise is a 12x12 double sided paper that sure to brighten up your layouts! By clicking the link below each picture, you'll be directed to our online store where you can purchase these products and more. Or stop into Creations Galore at 3164 Coronet Way in Green Bay, Wisconsin. We have 10,000 square feet of scrapbooking and card making products for you to see!